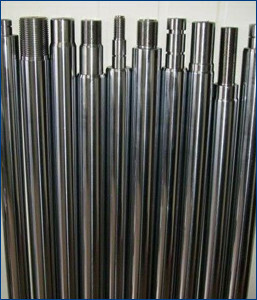 The Harden Ground and Hard Chrome Plated Bars which we manufacture and supply to the customers are inclusive of a high quality of products such as the Bearing seals which are high on demand for use in the automobile industries. Additionally, client can get the offered products from us at very economical prices and within given span of time. Shaft for L.M. Bearing / Piston Rod For Earth moving equipment shaft for fitness equipment Guide Pillar, Side Rail. Surface roughness : better than RA-0.2. Straightness : 0.1 per meter max.